Sass and Belle are always my first choice when it comes to gifts, party and homeware (I've featured them in a few of my student guide posts) - they have some stunning vintage and shabby chic inspired items that myself (and my mum) are slowly collecting! Now, the weather this bank holiday weekend isn't looking too pretty and with forecasts of rain and showers across the UK I thought I'd bring summer indoors! I've chosen some of my favourite Sass and Belle items to create a gorgeous tea/garden party vibe in my own living room! I am in love with this cute Arrow Chalkboard and when I saw it online I instantly imagined 'Tea Party This Way' scribbled across it! I think it would look great nailed to a tree or a garden wall but hanging it off a door handle or entwining it with a floral garland works just as well. I think chalk boards are such a cute but useful tool and you can use them to remind yourself of everyday errands or spread positivity - I recently bought my mum this Wooden Heart Chalk Board and my cat-loving best friend the Cat Chalkboard.Talking about floral garlands Sass and Belle do some real stunners! I picked out this Cream Rose Garland as I think it will be versatile during all the seasons - I know it's a bit early but I'm thinking with some fairy lights the cream roses will look very festive! Another way of bringing the garden indoors is by using bunting and this Meadow Floral Bunting does not disappoint. It is absolutely gorgeous and would brighten up even the plainest of walls - string it up on a garden fence or around the kitchen table, you really cannot go wrong with a bit of bunting.There are plenty more patterns and shapes on their online store, I have my eye on the British Birds Bunting because it's so different from anything I've seen before and I know my mum would love the Green Owl Bunting. I'm a firm believer in that it's not a party until there's cake and despite my somewhat "rustic" cake decorating skills this Bohemian Cake Stand steals the show. The Bohemian range is not something I'd immediately go for but I have definately been won over by the bright patterns and colours. The best part is that this cake stand even has my boyfriends seal of approval! You can now see why I don't run a food blog right? Last but definately not the least are these cute Hanging Hearts which are perfect for subtly adding a vintage twist to any room! You can hang these off of door/cupboard handles, in your window or just display them similar to how I have done on my cake stand. Sass and Belle have such a great range of these little hang-y things and they're perfect for gifts too - I think I have bought my mum every single hang-y owl that they sell! Pictures above is the Vintage Floral Hanging Heart in Pink and Cream and the Audrey Mini Hanging Hearts. 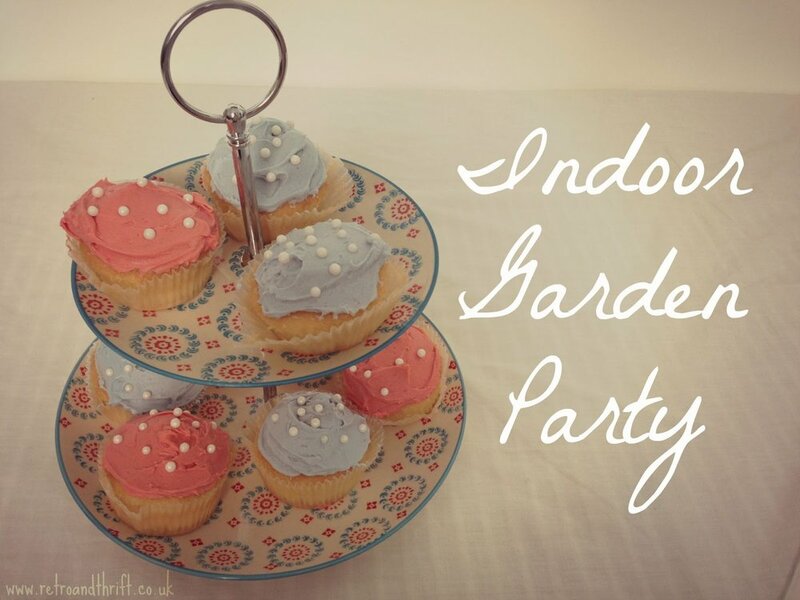 I hope this post inspired you to bring your summer garden party's indoors whilst the weather is miserable and I hope that you're all enjoying your bank holiday weekend! Lastly a huge thank you to Sass and Belle for allowing a very loyal customer to review some of their items, it has truly been fantastic!